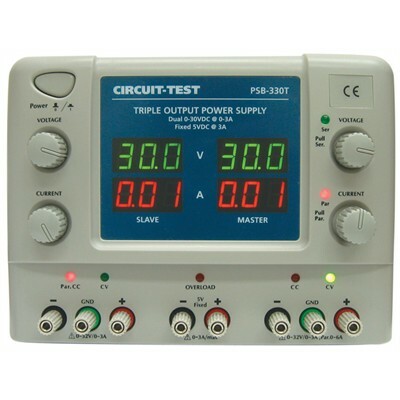 Triple output constant voltage / constant current DC adjustable power supply. There are three modes of operation: Independent, Serial, and Parallel. In the Independent mode, there are two variable outputs: 0-30 VDC @ 3 Amps each and a constant 5 VDC @ 3 Amps. In Serial mode, the output is 0-60 VDC @ 3 Amps and a constant 5 VDC @ 3 Amps. In Parallel mode, the output is 0-30 VDC @ 6 Amps and a constant 5 VDC @ 3 Amps.